The average cost of assisted living in South Boston is $3,225 per month. This is lower than the national median of $3,345. To help you with your search, browse the 7 reviews below for assisted living facilities in South Boston. On average, consumers rate assisted living in South Boston 4.6 out of 5 stars. Caring.com has helped thousands of families find high-quality senior care. To speak with one of our Family Advisors about assisted living options and costs in South Boston, call (855) 863-8283. The town of South Boston, Virginia, was founded in 1854 as a railroad depot and grew to become the largest bright leaf tobacco market in the country before the turn of the century. As a result, landmarks such as the Tobacco Heritage Trail are available in South Boston, Va., for seniors to explore. Seniors can also look into two Assisted Living Facilities (ALFs) in the city of South Boston — if they are in need of residential facilities that provide 24-hour supervision as well as personal and health care services. ALFs policies are regulated by the Virginia Department of Social Services. South Boston seniors have no shortage of ways to spend their leisure time. Seniors can take a trip to Halifax County Little Theatre to see a play, or visit The Prizery, an important part of the South Boston Historic Tobacco District, that has been turned into an art gallery and performance art venue. Seniors on a budget can build savings easily living in South Boston. The cost of living in South Boston is rated at 22.5 percent lower than the national average. The South Boston area is home to world-class medical facilities, including the Sentara Halifax Regional Hospital, in the event of medical emergencies or illness. While public transportation in Halifax County is limited, the Lake Country Area Agency on Aging operates a fleet of vehicles that assists seniors in Halifax, Mecklenburg and Brunswick counties go to doctor’s appointments, run errands, and engage in social activities. Seniors and loved ones may want to take safety precautions in South Boston due to the higher crime rates. Violent crime is rated at 36.2 out of 100 (1 being the safest), which is higher than the national average of 31.1. Property crime is rated at 59.6, which is much higher than the national average of 38.1. South Boston has a mild four-season climate. With an average high temperature of 89 degrees in the summer, seniors can enjoy outdoor activities with ease. Winters are chilly with average low temperatures of 26 degrees, but with only five inches of snowfall, seniors may still have an easy time getting around. Assisted Living costs in South Boston start around $3,225 per month on average, while the nationwide average cost of assisted living is $4,000 per month, according to the latest figures from Genworth’s Cost of Care Survey. It’s important to note that assisted living rates in South Boston and the surrounding suburbs can vary widely based on factors such as location, the level of care needed, apartment size and the types of amenities offered at each community. Low-income seniors in Virginia seeking financial aid for assisted living costs may be eligible for help through the state’s Medicaid Assisted Living Waiver. 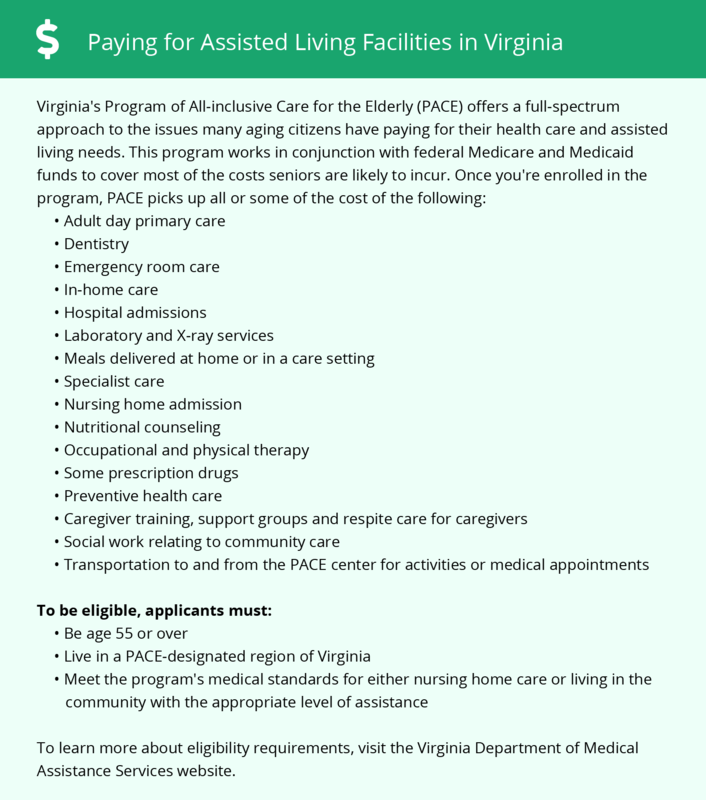 As well as offering Medicaid assistance, Virginia has the non-Medicaid Auxiliary Grant program for qualified seniors. South Boston and the surrounding area are home to numerous government agencies and non-profit organizations offering help for seniors searching for or currently residing in an assisted living community. These organizations can also provide assistance in a number of other eldercare services such as geriatric care management, elder law advice, estate planning, finding home care and health and wellness programs. To see a list of free assisted living resources in South Boston, please visit our Assisted Living in Virginia page. South Boston-area assisted living communities must adhere to the comprehensive set of state laws and regulations that all assisted living communities in Virginia are required to follow. Visit our Assisted Living in Virginia page for more information about these laws.